As you might know, copper holds a special place in the constellation of commodities. It’s sometimes known as “Dr. 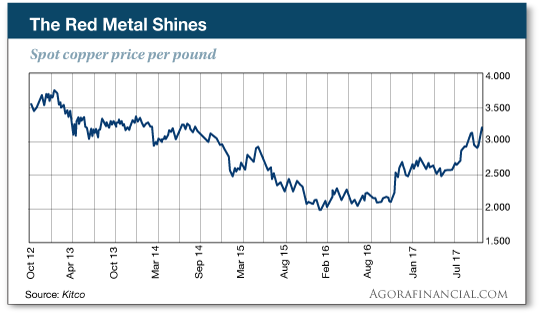 Copper,” the metal with a Ph.D. in economics. Because copper has so many uses, its price is thought to be a powerful reflection of global economic activity. Copper’s resurgence is even stronger than it looks on that chart. Three years ago, the dollar was much weaker. The U.S. dollar index — a yardstick measuring the greenback relative to six other developed-world currencies — stood at 85 the last time copper was meaningfully above $3 a pound. But the dollar index is much stronger now — 93.7 as we check our screens this morning. Makes sense at a time when industrial giants like Caterpillar and 3M are posting gangbuster numbers. Alan recently spotted the perfect way to play it in Weekly Wealth Alert. His patent-pending system detected unusual options activity… and on Monday he urged readers to pounce on the opportunity for quick gains in the next two weeks. It’s still not too late to get in on this play… but if the price does run away by the time you read this, Alan’s system spots new opportunities all the time. And every one of them has the potential to pay off in 10 trading days or less. Learn more about the difference this system can make to your retirement savings right here. As earnings go, so goes the market. On this day, AT&T and Boeing disappointed. Thus the Dow is off about a quarter percent from yesterday’s record close. Treasuries have been losing ground for the last two weeks, and they continue to lose ground today. Falling prices mean rising yields… and at 2.46%, a 10-year Treasury note yields the most in seven months. Gold has slipped to a three-week low at $1,272. China now has the most powerful leader since Mao Zedong… and Jim Rickards says he faces an economic train wreck that could easily trigger the next financial panic. As you might have seen in the news, the Communist Party has elevated Xi Jinping to a position of power unparalleled since the days of Mao… and judging by the new lineup of the seven-member Politburo Standing Committee, he has no obvious successor once his second five-year term is over in 2022. But Xi isn’t the all-powerful leader the media are making him out to be, says Jim. For one thing, Xi’s most trusted aide, Wang Qishan, was removed from the Politburo Standing Committee. There were rumblings that Xi would push to keep Wang on the committee despite reaching mandatory retirement age… but Wang is gone. But it gets worse: “Notwithstanding the political intrigue, it is not clear that even a newly empowered Xi is prepared to tackle the structural economic problems confronting China,” Jim says. “Xi has not faced up to the toxic combination of bankrupt state-owned enterprises (SOEs) and insolvent banks that are the real threats to Chinese stability. “The debt problem in China is ubiquitous. Provincial governments have created systems of guarantees to get around limitations on borrowing. The provinces have no hope of making good on those guarantees; they are relying on Beijing to bail them out. “Individuals have invested over $1 trillion in so-called ‘wealth management products’ (WMPs), that even the chairman of the Bank of China has called a ‘Ponzi scheme.’ WMPs are sold in banks and offer higher yields that bank deposits. Investors believe that the WMPs are guaranteed by the bank, but they’re not. “These economic challenges threaten to emerge unexpectedly in ways that could cause a financial panic in China,” Jim concludes. And even if Xi manages to hold everything together with paper clips and rubber bands, Jim says he will likely resort to a “maxi-devaluation” of the yuan — as much as 20% against the dollar. “The 2017 pullback in General Electric is a gift to investors,” says our income specialist Zach Scheidt. We gave GE some negative ink yesterday in light of the terrible year it’s having. Greg Guenthner said GE’s a buy… but not until it’s kicked out of the Dow Jones industrial average, perhaps sometime next year. The banks got away with it again. Yesterday, the Senate voted to overturn federal regulations that made it easier for consumers to file class-action lawsuits against banks. Vice President Pence cast the tiebreaking vote. Ordinarily we’re all for deregulation and keeping a lid on lawsuits. But for cryin’ out loud, the banks? Banks have the implied guarantee of a taxpayer bailout if they make boneheaded decisions. Until they give up that crony-capitalist privilege, something’s gotta keep ’em in line. Zach recommends three of the Big Four commercial banks in Lifetime Income Report. Two of those three beat Wall Street’s expectations when they reported earnings earlier this month. Wells Fargo was the laggard, thanks to the bogus-accounts scandal. But that’s in the rearview now. Citi, for example, got the go-ahead from the Federal Reserve to hand a bigger share of the company’s earnings to investors by way of dividends. The company swiftly doubled its dividend from 16 cents to 32 cents. And Citibank’s stock is set to earn $5.92 per share next year… That means Citi has plenty of margin to increase its dividend. “Bank of America and Wells Fargo are in a similar position,” Zach says. For access to all of Zach’s favorite U.S. dividend players — “patriot checks,” he calls them — give this a look. We should’ve expected this in the mailbag after we pointed out yesterday that Donald Trump and George H.W. Bush are the only presidents of the last 35 years to inherit a years-long economic expansion. Aw c’mon. You must be newer readers. We didn’t say it was a robust expansion. As Jim Rickards has pointed out more than once, the last decade amounts to the classic definition of a depression — a long period of “below trend” economic growth. But growth it is, however anemic. Even the real-world unemployment rate from Shadow Government Statistics is at a seven-year low of 21.9%, having peaked in late 2013–early 2014. We’re not sure what the reader’s point is. The Dow peaked 10 years ago this month going into the “Great Recession” and finally clambered back to breakeven in April 2013. It’s up 63% since then. Maybe the reader was pointing out that all the funny money the Federal Reserve created from 2008–2014 benefited financial markets far more than the real economy. Wall Street, not Main Street. In which case, we heartily agree. We said so, often, a few years back. 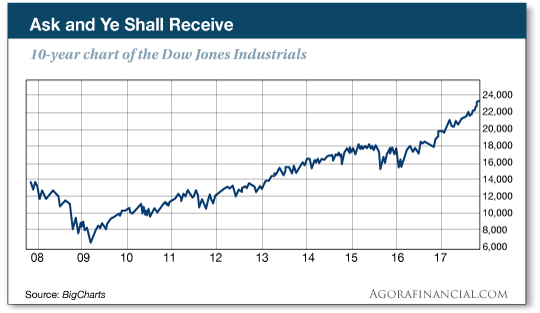 We’ve had less occasion to say so more recently… because this expansion (such as it is) has reached a point that the stock market rally is feeding on itself. At least for the moment, it doesn’t matter that none of the causes of the 2008 crisis have been fixed. Yes, it will matter again, eventually… and we’re on constant watch for the warning signs. One more word of caution, inspired by today’s reader correspondence: Don’t let your politics drive your investing decisions. Yes, politics affect the economy and the markets. But legions of limousine liberals have missed out on big stock market gains this year because they were certain Donald Trump would drag us all into an economic black hole. And many conservatives missed out on a huge chunk of the post-2008 rally because they were certain Barack Obama would bring on total collapse. In both cases, they fell victim to what might be the most dangerous word in all of investing — should. Just because you think a politician’s rhetoric or policies should create a certain result doesn’t mean it will. P.S. A caveat to our caution about politics and investing: In some cases, it’s entirely possible to identify individual stocks that stand to benefit from government policy. You just have to follow the money. In fact, one of our contributors says you can transform a month’s pay into a six-figure fortune… if you know how to follow the money. Curious? You’ll want to check this out.